To build strong corporate relationships. To promote the Student’s achievement and recognition to attract potential recruiter. To promote advanced and industry aligned academic learnings at Campus. To build student identity and personification, highlight the intellectuals of students. The campaign was run to promote and build corporate relationships, academic learnings at the campus. Collection of Students achievements testimonial and share it over social media. Highlights the competitions won by the students and share it over social media. User-generated content over social media, by retweet, tweet, and share. Social Media has involved a medium of communication globally. Majority of corporates are part of social media and their presence can be seen via jobs, achievement, knowledge, idea and other posts. Most of the companies do use social media recruitment or campus hiring, in that scenario Institute with strong social media influence can leverage the opportunities in a better manner. MICA capitalize on the power of social media for building strong corporate relations and advocating students’ achievement. 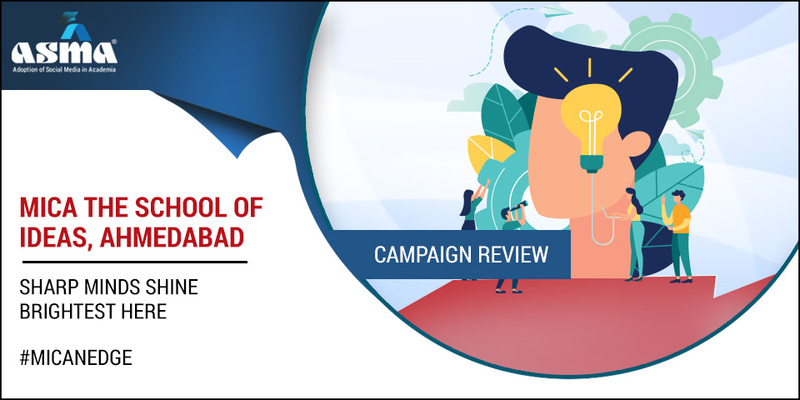 The proactiveness towards social media influences the corporate, showcasing what is so best about MICA, ultimately talent matters for any company and that’s what highlighted through social media. Students are the base of any institute, they bear the entire burden to make an institute stable. They represent the institute; the quality of student showcases the kind of academic learnings an institute have any kind of brand institute has built over the period of time. Explore more opportunities to build corporate relations, showcasing the industry aligned learnings and intellectual levels of students at MICA. Created a social media buzz about students’ achievement and recognition over twitter and Facebook, poster & banner have been shared over social media. With more than 84,000 followers over Twitter, connecting the target audience makes more sense for MICA. The post related to competition, case studies and other events have been shared and promoted. Post related to Top B Schools competition and achievement of students. Post related to the enthusiasm and motivation of students to be proactive towards such extracurricular activities. Post Related to the competition organized by Corporate and student’s recognition in these events and competitions. More than 80,000+ likes over Facebook, the advocating students over it make it easy for MICA to connect with the audience, it not only motivates the existing students but creates the aura for prospective students to join MICA. Post related to total numbers of competition and case study rounds be it organized by corporate or B schools won by students of MICA, defined as YEAR OF GLORY. Post related to corporate events and getting opportunities to work on corporate live projects. Instagram posts are basically cross promotion post of Twitter or Facebook, highlight the stories of students and their dedicated journey to success. LinkedIn is the most prominent and used the platform to connect with professionals and corporate. The posts have been shared on LinkedIn too. Share and promoted by the top-level management of corporate, feeling happy to be a part of events and competitions. Share and Promoted by working alumni of MICA, wishing juniors for excelling in the competitions. 84% of Recruiters find the usage of social media for college hiring is important.